Provides support to the female glandular system, particularly before menstruation. Plays a role in proper nerve development and function. Provides 130 mg of gamma-linolenic acid per capsule. 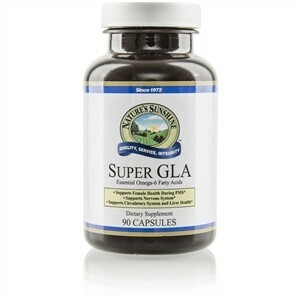 Super GLA provides generous amounts of essential omega-6 fatty acids (both linoleic and gamma-linolenic acid) from evening primrose, black currant and borage oils. In the body, these can be converted into eicosanoids. Three important eicosanoids are prostaglandins, thromboxanes and leuko-trienes. This group of hormone-like compounds regulates many important bodily functions and processes. These compounds may affect circulatory system health, skin and joint health, immunity and nerve function. Super GLA provides nutritional support to the female reproductive system, particularly before menstruation when normal conditions of mild mood changes, breast tenderness, cramps and swelling can occur. Evening primrose oil, black currant oil and borage oil.